Of all the Scottish salmon fishing destinations the mighty River Tay is one of the most accessible and reliable salmon rivers. 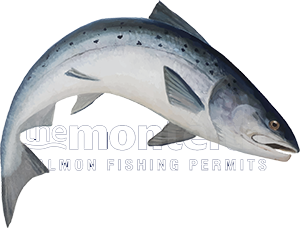 This fact is primarily due to the sheer size and depth of the river which has fresh run salmon coming in off every tide throughout its long salmon fishing season which spans from the 15th of January to the 15th of October each year. If you're time restricted the River Tay is the safest Scottish bet for placing your salmon fly in front of a cooperating fish. I was fortunate to catch my very first salmon back in 1970 on this famous Scottish salmon river under the guidance of the late legendary Willie Laird who had been head ghillie on the then Birnam Beat of the Tay for 50 years and his father before him. These old Tay ghillies (or guides) where a fantastic team of river experts who knew every boulder of their respective beats and exactly where salmon could be caught on any fishing day of the year. This early life River Tay experience was so inspiring I chose a career in salmon fishing and this is one main thing I've never lost sight of when it comes to making sure all fishing guests get the best possible first impressions of this famous Scottish river and this amazing sport. River Tay salmon fishing forms a big part of recreational pursuits in Scotland and it's massively important to the Perthshire rural economies that comes from visiting salmon fishers. If you're planning a Scottish salmon fishing trip then this river has to be built into your fishing itinerary. Some of the famous Tay salmon beats have vibe, natural beauty and character you'll not experience on any other Scottish salmon river. In addition to this the Tay has always been regarded as a big fish salmon river and of all of the Scottish salmon rivers the River Tay is also the most likely venue you'll find in Scotland for producing double figure salmon.